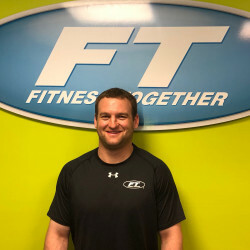 Get to know our friendly Fitness Together® Personal Training Staff at Portsmouth. Sean believes that fitness can and should be fun AND effective. Much of his free time in the summer/fall is coaching the Amesbury High girls’ varsity soccer team. But he and his fitness team understand that sometimes, exercise takes a back seat in life, and it’s difficult to begin any fitness program. His goal is to motivate, empower and improve the overall health of each and every client who walks through his doors. Brandon Sanschagrin grew up in the small town of Gorham, NH. He has always been involved in sports and fitness since an early age, where his love for physical fitness grew strong. He experienced first-hand the direct association between sports, fitness, and personal satisfaction. From a young age, he knew that he wanted to pursue a career in health and fitness. He obtained his Bachelors of Science in Exercise Science at Colby-Sawyer College. By completing different internships in Cardiac Rehab and Strength and Conditioning, this has only broadened his knowledge on working with many different types of clients. No matter whom the client is, Brandon always devotes 100 percent into making his clients the passion of his work. Fitness is his passion. It is something that he loves learning about and pursuing. His greatest satisfaction comes from having a positive impact on people’s lives and seeing their health and confidence grow. 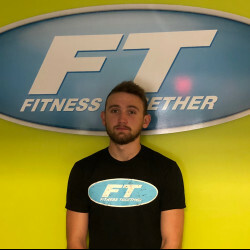 Having Brandon part of the Fitness Together family, and sharing his passion and enthusiasm for fitness makes the clients fully engaged in every session. Taylor is a graduate of the University of New Hampshire (2011), where he earned a bachelor’s degree in Kinesiology and Sport Studies. In 2017, he completed his Master’s in Education and Athletic Administration at Endicott College. 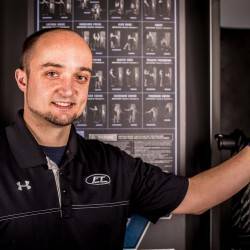 Taylor is certified through the National Strength and Conditioning Association as a Strength and Conditioning Specialist. He also maintains a level IV ice hockey coaching certification through USA Hockey. Taylor is a three-time Paralympic Medalist and competed internationally on the United States Paralympic Sled Hockey team for twelve years. Previously, he worked as a sports performance coach for competitive athletes with physical impairments at Northeast Passage, a program based UNH and also interned for Rehab Three Center for Athletes in Somersworth, NH. Additionally, Taylor worked for Exeter Hospitals Athletic Performance Center where oversaw programming for their off-campus facility in Exeter, NH. Most recently working as a part time Assistant Strength and Conditioning Coach at UNH for the varsity athletic department. As a former competitive athlete, Taylor knows the importance of a well-planned physical training routine in order to maximize an athlete’s mental and physical potential. His life changed forever at age 16 when he suffered a spinal cord injury playing in a junior hockey game in Canada. Initially paralyzed from the waist down, after lengthy spine surgery and more than 2 years of inpatient and outpatient rehabilitation, he now walks without assistance despite mixed paralysis in his lower body. He attributes much of his success in rehabilitation to my former dedication to training for sports as a young teenager. 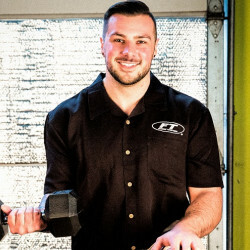 Taylor believes that the most effective strength and conditioning programs are those that incorporate a proper balance of injury prevention, sport specific skill practice, strength, plyometric and speed exercise, and strongly believes that developing healthy habits through exercise early in life can positively impact other areas of a person for a lifetime. Sierra grew up in Woodstock, Vermont.She has been very involved in sports and outdoor activity throughout her life such as snowboarding, hiking and playing lacrosse as well as ice hockey. Despite being active she still had her own weight struggle. Going into her Freshman year of college she made the decision to become more serious about her fitness to get ready for her first season as a college athlete. She was able to lose 50 pounds by the following spring. Through that weight loss she then found her passion for fitness and creating a better quality of life. Sierra received her Bachelors of Science in Exercise Science in 2016, and her certification from National Academy of Sports Medicine in 2018. Her goal is to help you meet your goals and find your inner strength through fitness. She believes that exercise is the best medicine and loves to educated people on how to implement it into their everyday life. 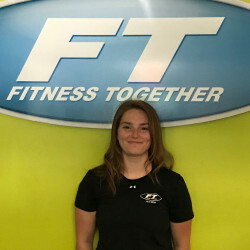 Hannah has been a manager and fitness coach at Fitness Together Newburyport for 5 years. 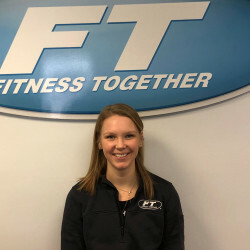 She has a true passion for fitness which developed in her early years, especially as a cross country runner at Newburyport High school and in college. She attended both Keene and Salem State universities, where she studied communication and exercise science. Hannah moved to Tucson, AZ after graduating college, where she worked as a chiropractic assistant. This experience allowed her interest and knowledge in the health/wellness field to flourish. Pursuing her fitness career more seriously a few years later, she attended the National Personal Training Institute in Waltham, MA. Her first fitness coaching position was at Fitness Together, and the rest is history. Realizing the delicate balance between exercise, keeping it fun, and reaching goals, Hannah continues to strive towards becoming the best fitness coach she can. Although she has many management duties, her favorite time is spent training clients. Hannah’s confidence as a fitness coach arises from the many client successes she’s been a part of. With the right mind set, commitment, and hard work, anything is possible! recently he has started playing for a semi-pro football team, the seacoast war hawks out of Dover, New Hampshire. in a positive way day after day. Keith received his certification through the All Pro Sports and Fitness Association and is CPR/AED certified through the American Red Cross association. Ari grew up in the heart of the granite state of New Hampshire. With her two sister and parents, the Kinder life evolved around horses, sports and spending every moment in the White Mountains. Ari is a firm believer that a good quality of life, high energy, and excellent performance is directly linked to the proper way we use our bodies; nutritionally, physically and mentally. With a passion to helping others become the best they can be, Ari knew she belonged in the world of health and wellness. 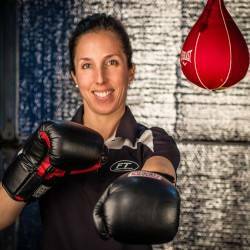 After graduating from Plymouth State University in 2014 with a degree in Exercise and Sport Physiology, Ari explored all aspects of her career. From the inpatient clinical side on the Oncology floor at Dartmouth Hitchcock to the Elementary schools in Palo Alto CA, teaching kids the importance of physical activity. With that, Ari’s hope is to inspire and teach people how to feel good EVERYDAY! With her last experience working with cancer survivors in the North Shore YMCAs, Ari wants to continue to train individuals who have experienced cancer or chronic illnesses and help them reach their full potential. When Ari isn’t in the gym you can find her outside on the trails or on top of a mountain with her pup, Franki Ridge.